HONK! Festival: festival of activist street bands, taking place in various neighborhoods throughout Somerville, Cambridge, and Boston. HONK! Fest; photo credit Tim Pleck. SOMERVILLE, Mass. - Sept. 16, 2016 - PRLog -- For eleven years now, the HONK! Festival of Activist Street Bands (http://honkfest.org/) has been altering the outdoor musicscape of Somerville and surrounding areas, by celebrating the sound and spectacle of brass and percussion in the service of participatory culture and social justice. Held rain or shine; free and open to all. For further information: www.honkfest.org, 617-383-HONK (4665). The energy surrounding the HONK! Festival has been positively infectious, so much so that HONK!, which originated in Somerville, has spawned related festivals in Providence, New York City, Seattle, Eugene, Austin, Pittsburgh, and Detroit, not to mention Wollongong, Australia, and Rio de Janeiro. Participants, including the audience, have reported peak musical moments and life-changing experiences. There is even a Somerville-based School of HONK that carries on the spirit of the Festival all year round. Needless to say, it is thrilling that HONK! has generated the creative energy and unbridled enthusiasm that propels the original HONK! into its second decade of playing music that matters. There will indeed be more than enough music to please everyone, with over two dozen bands performing this year. Some will be the usual suspects, from all over the US and Canada, who may be familiar, but who always sound fresh. In addition, HONK! has made arrangements to present two new bands from France, La Fanfare Invisible from Paris and Le Pompier Poney Club from Marseille. And as part of HONK! 's continuing commitment to pay tribute to the music and culture of New Orleans, HONK! has invited back by popular demand the The Original Pinettes Brass Band. aNova Brazil (Somerville, MA); Boycott (Somerville, MA); Brass Messengers (Minneapolis, MN); The Brass Balagan (Burlington, VT); The Bread and Puppet Circus Band (Glover, VT); Caka!ak Thunder (Greensboro, NC); Chaotic Insurrection Ensemble (Montreal, QC); Detroit Party Marching Band (Detroit, MI); Dirty Water Brass Band (Boston, MA); Emperor Norton's Stationary Marching Band (Somerville, MA); Environmental Encroachment (Chicago, IL); Expandable Brass Band (Northampton, MA); Extraordinary Rendition Band (Providence, RI); La Fanfare Invisible (Paris, France); Forward! Marching Band (Madison, WI); Hartford Hot Several (Hartford, CT); Leftist Marching Band (Portsmouth, NH); Mayday Marching Band (Pittsburgh, PA); The Original Pinettes Brass Band (New Orleans); The Party Band (Lowell, MA); Le Pompier Poney Club (Marseille, France); Rude Mechanical Orchestra (New York City, NY); School of HONK (Somerville, MA); Second Line Social Aid and Pleasure Society Brass Band (Somerville, MA); What Cheer? Brigade (Providence, RI); and Yes Ma'am Brass Band (Austin, TX). Further information on each band can be found at www.honkfest.org/2016-festival/bands-2016. The Festival will include all the HONK! traditional features that have compelled thousands of participants to return year after year, with family-friendly Lantern Parades through the neighborhoods of Somerville; nine hours of continuous free performances by dozens of HONK! bands in Davis Square; the massive and overwhelming energetic HONK! Parade that makes its way down Massachusetts Avenue to "Reclaim the Streets for Horns, Bikes and Feet," followed by a full afternoon of HONK! performances at Oktoberfest in Harvard Square. HONK! organizers are planning to expand the HONK! 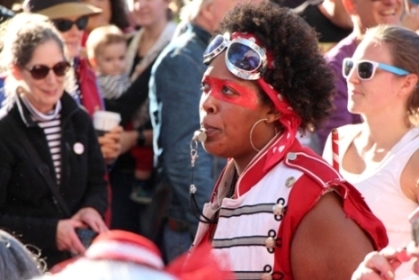 Day of Action to incorporate more political themes and performances throughout the Festival, while never losing sight of pairing those undertakings with irresistible music, outrageous costumes, and dancing in the streets. Updates for the Festival will be posted at www.honkfest.org/2016-festival/schedule-2016. -- HONK! supporters from the Nave Gallery Annex, locatedat 53 Chester St. in Somerville, have sent out a "call for entries" (deadline September 17th) soliciting photographs taken during HONK!s past, to be included in their upcoming HONK! Deconstruction of Joy. The exhibit runs from October 6-22, with an art opening on Thursday October 6th from 6-8 pm. The exhibit is being organized by Leonardo March, a photojournalist hailing from Puerto Rico, who is now based in Boston. For further information: www.navegallery.org/wp/honk-deconstruction-of-joy. HONK! is a non-profit organization, with a limited budget, with their annual Kickstarter fundraiser now in full swing: www.honkfest.org/kickstarter. For complete information and continuous updates on the HONK! Festival, visit www.honkfest.org, www.facebook.com/honkfestival, and www.twitter.com/honkfest.